Boiled linseed oil is linseed oil that was mixed with a desiccant. It is added to linseed oil pastes to form a spreadable linseed oil paint. For this purpose, it is stirred in equal parts of boiled linseed oil and linseed oil paste including the desiccant. The amount of desiccant varies from color to color. Good boiled linseed oil has a bright clear color. It's a little thicker than cold-pressed linseed oil but without being viscous or too oily. 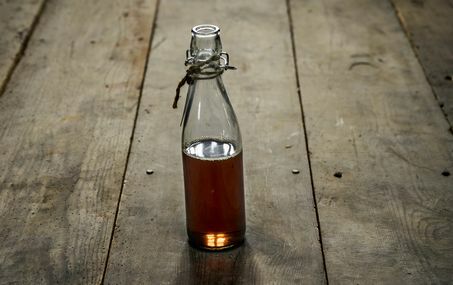 Boiled linseed oil usually dries within 16-18 hours, in some cases 24 hours. 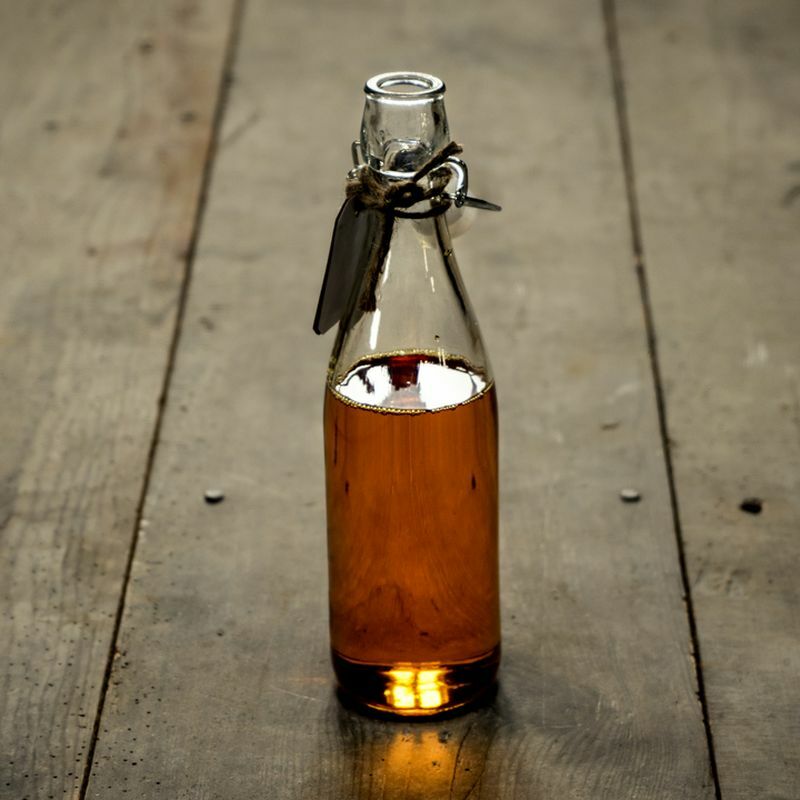 Boiled linseed oil should be stored filled to the top of its container and closed shut air tight before storing. If not stored properly, it gradually becomes thicker and more vicious or compound, and subsequently loses its good quick drying properties. Cold-pressed linseed oil is ideally suited for priming wood. Our linseed oil of northern origin of (Sweden) is free of mucilage and of the highest quality on the market. 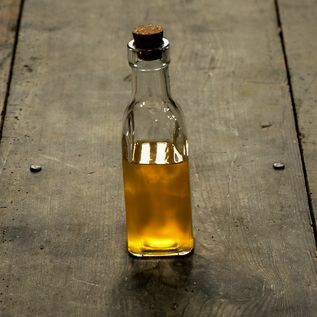 Cold-pressed linseed oil dries much slower than linseed oil varnish, thus it needs less time to penetrate the subsoil, without forming a film on the surface. It is, therefore, safe to say that after allowing only one day to elapse following treatment, any excess oil should be wiped with a cloth. Highly absorbent areas should be treated with multiple coats of linseed oil. When the wood is dry, the next layer can be applied, even if the oil is not yet cured. Linseed oil hardens naturally by absorbing oxygen. Through this process, it gains about 15-20% in volume. The crude linseed oil penetrates deeply into the wood pores making it water repellant. Important: Cloth that has been soaked in this particular oil cloth are self-inflammable. This windowbrush is a round brush with long pointed bristles and reinforced metal ferrule. The bristles are cone-shaped. This brush lies comfortably in the hand! The brushes we offer are made of light, flexible natural hair. The bristles are carefully sorted, cleaned and boiled twice, which gives the hair softness and maintainable stability. We only use high-quality bristle in production. Thus, the bristles are approximately the same length. This makes it unnecessary to provide any additional support to the bristles. This allows the color to be absolved best. In order to preserve the split peaks of the individual hair, which hold the color best and ensure an even application to the surface. Handcrafted pointed window brush for wood work, cutting and varnish. Pure light Chinese bristles and an unlacquered handle. 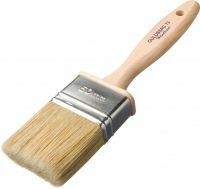 The brush is suitable for all types of paint especially for windows. The oval brush is a handcrafted brush with long bristles and reinforced metal ferrule. It is especially shaped for best colour carrying capacity.This brush lies comfortably in the hand! Handcrafted oval brush applicable for linseed oil paints and lacquer. Genuine light Chinese bristles and an unlacquered handle. Suitable for all types of paint. The round brush is a handcrafted brush with long bristles and reinforced metal ferrule. It is especially shaped for best colour carrying capacity. This brush lies comfortably in the hand! Handcrafted round brushes applicable for linseed oil paints and lacquer. Genuine light Chinese bristles and an unlacquered handle. Suitable for all types of paint. 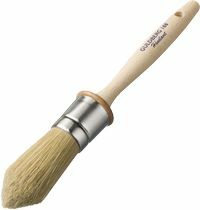 The wooden brush for Tonkin lacquer and linseed oil paints is a flat brush with long bristles and reinforced metal ferrule. It is especially shaped for best colour carrying capacity. This brush lies comfortably in the hand! The brush is suitable for big areas, floors and walls and can be purchased in two different sizes. Handcrafted brush for wood protecting purposes. Genuine light Chinese bristles and an unlacquered handle. Suitable for all types of paint. Universal soap: ideal for hands, kitchen, bathroom, tiled and wooden floors. To clean brushes. Cleaning of metal before applying a coat of paint. Linseed Oil Soap is the ideal cleanser for brushes. After use, you should clean the brush well and place it for about an hour in pure linseed oil soap. Then rinse it thoroughly with hot water and repeat the process if necessary. Even a dried brush can be cleaned with linseed oil soap, in this case, the brush should be left in linseed oil soap for a few days, and then thoroughly rinsed. Dosage: 100 ml soap per 1 l water. The exact dosage depends on the hardness of the water. Soft water = less soap. If foaming water appears in the cloth or sponge, there is enough soap in the water. Treatment of wooden floors: Wash your wooden floor with linseed oil soap in order to repair blemishes on the surface. Hereby, the temperature of the water is very important. Lukewarm water is best suited. Wood absorbs excessive amounts of water when it is too warm and causes the wood fibers to raise. Cold water, on the other hand, opens the pores of the wood. Linseed oil soap removes dirt effectively. In addition, it has a bleaching effect on untreated wood. Wash the wood floor always in the direction of the wood grain and work the soapy water thoroughly through. Ideal would be to use a “good old mop”. Please be sure to rid the mop of any excess water. Opening a window allows the floor to dry best. The soap treatment may be reiterated or repeated once a month. The floor will become lighter with every treatment and easier to maintain. The more the soil is saturated with soap, the more stain-resistant and more robust it will become. Treatment of stone flooring and tiles: Linseed oil soap will give stone stairs and floors, tiles, bricks, slate floors a deep shine. The wooden floor will automatically form a thin dirt-repellent layer after treatment. Linseed oil soap is also effective in removing linseed oil paint stains in textiles. To do this, simply rub it in pure directly to the stained area and wash as usual. Repeat as necessary. If the stain is a little older, then you should moisten it with water beforehand and then proceed as described above. The soap is also suitable for the cleaning and maintenance of clinker and stone floors. The vegetable oils in the soap form a dirt repellent finish. Contains: Organically grown linseed oil. Linseed soap is ideal to clean brushes and for cleaning of metal before applying a coat of paint and much more.